Rediff.com » Business » Amazon adds 180,000 items for India every day! Amazon adds 180,000 items for India every day! Amit Agarwal tells Suveen Sinha about how he implements an American entrepreneur's vision in a very Indian way. IMAGE: "Globally, we have hundreds of millions of products. But there is homogeneity in the US. India has so much diversity there is no reason we cannot have 25 times the number of items in India," says Amazon India head Amit Agarwal. Photograph: Reuters. If you meet Amit Agarwal five months apart -- as this writer did, in October last year and March this year -- the crux of the interviews would likely be the same. Agarwal would say that the magic of e-commerce lies in getting you what you want at a low price and have it delivered it fast. He would talk about the three pillars of Amazon being selection (the number and range of its offering), competent prices, and fast delivery. Sure, some numbers would change: the selection increased from 85 million items in October to more than 100 million in March. But the crux of the conversation remains the same because, as Agarwal puts it, he has been doing the same thing every day for the past four years. "Every day we ask ourselves, how do we add more selection? What tool shall we build for sellers so they can offer better pricing? How can we deliver better and faster?" And Agarwal would talk about Amazon's belief in having a "stubborn vision" that may be accompanied by a "flexible execution". These are things that have remained constant not just for the last four years but 20. Many of these were laid down in the famous letter to shareholders Amazon's founder and CEO, Jeff Bezos, wrote in 1997, the year the company went public. Part of global business legend now, that letter was all about the long term, ignoring a publicly held company's need to deliver quarterly rise in profits. What Agarwal has done is he has used the "flexible execution" option to implement in India an American entrepreneur's vision in a very Indian way. "We are an Indian global company," he says. It is not a hollow claim. About three or so years ago, when discussions over cups of tea were swaying the course of a Parliament election, Amazon was having its own Chai Pe Charcha with the people who sell on its online marketplace. Whenever Amazon's people went to sellers to bring them online, their hosts asked: "Chai peeyenge kya (Will you have tea)?" Amazon saw that a lot of people in India did not trust online transactions, but they trusted the local service provider. So, Amazon decided to get out of the way. Its Project Udaan turned the local service provider into an ally that would sell products for Amazon. The global concept of Amazon fulfillment centres, where things are delivered by sellers and picked up by couriers after packaging, acquired a new dimension in India. "When we went to small shopkeepers, we found they had owned the shop for generations; their fixed cost was zero. Why would they come to our fulfillment centres?" says Agarwal. So, he started Easy Ship, which comes to the shops to pick up their products. A programme called I Have Space has turned the local grocery stores, bakeries, daycare centres -- people who know their neighbourhood -- into Amazon's partners for delivery of products. It now has a network of 12,500 in more than 50 cities. IMAGE: Amazon founder and CEO Jeff Bezos, left, with Amit Agarwal in Bengaluru. And then there is the first pillar, the one of selection, where Agarwal sees India galloping ahead of Amazon's more developed markets, such as the United States, in the number of items sold. "Globally, we have hundreds of millions of products. But there is homogeneity in the US. India has so much diversity there is no reason we cannot have 25 times the number of items in India," he says. He is proud of a thank-you email sent by a woman whose family moved from Andhra Pradesh to Assam. This woman was having trouble cooking for her family because she wasn't getting her favourite spices in Guwahati -- until she found them on Amazon, which could be delivered to her home in a day. Her email said Amazon had finally made her feel at home in Assam. That email makes Agarwal smile not just with pride, but also empathy. He grew up in Mumbai, as did his wife. Both believe no other city can get the Vada Paav masala right. Amazon can deliver the Mumbai masala anywhere in India at a day's notice. It is an approach that came in for flak from rivals such as Flipkart. During the last festival season of Dussehra and Diwali, the sale of small items like churan and hing became a talking point. Amazon, as usual, took pride in its ability to sell and deliver these. Rivals did not think much of it. The rivals' scoffing was not without reason. How much money can one make by involving a cumbersome system of sourcing and delivery in a small, low-value item? 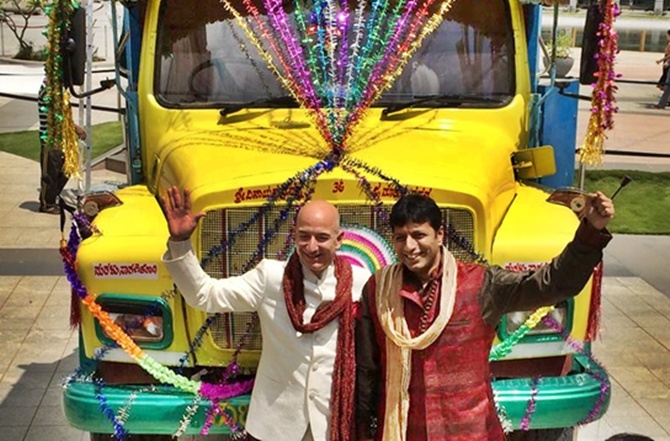 Agarwal has a ready riposte: "Our vision is to build the earth's most customer-centric company. That can be done by identifying their needs, and gaining the skills to deliver their need. That is different from the model others follow, which is to make a business out of what you have." The result is that Amazon adds 180,000 items to its India platform every day. Once you let that figure sink in, you might wonder why it is important to have every thing anyone anywhere needs. The 85 million products Amazon had last October would pretty much cover most of everyone's needs. Why raise it to 100 million, and then keep adding to that enormous number every day? Agarwal offers two reasons for that: trust and habit. "The beauty of the online model," he says, "is that there is no shelf space. If there exists some person in India with some need at any given point, and if you cover that need, you build trust." And, if you convince people that there is a place where you can find anything you need and have it delivered fast, it becomes an everyday habit, the holy grail of any commerce. Indians anyway like to see a large number of options before deciding, a trait Amazon captured in its "Aur Dikhao Aur Dikhao" (show me more) campaign. The numbers back up this approach. 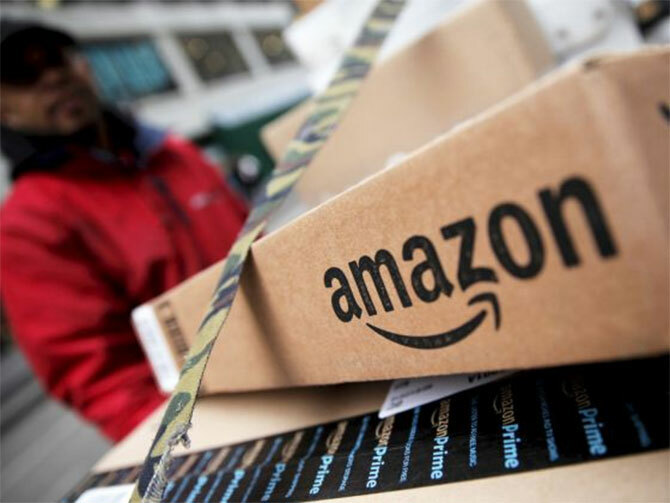 Reports say Amazon India's gross sales volume grew 85 per cent in the three months to March over the same period last year. That is seen to be much faster than Flipkart, which itself is in the throes of a revival: of business and funding. Just as important, Amazon has come to be seen at the centre of all big events in Indian e-commerce. If Flipkart raises funds, it is arming itself to fight Amazon. If Snapdeal is not facing the happiest tidings, it is because Amazon has taken the wind out of its sails. Will rivals unite to fight Amazon India? Why is Amazon betting big on self publishing in India?